The European cultural history has its own record of urban development, including the grid-type. The earliest evidence of barrack-type (‘kasernen-artige’) of settlements with a circular wall was found in Senftenberg near Cottbus (Germany). The complex dated from the end of the Bronze Age, around 800 BC (KUCKENBURG, 2000). The late Bronze Age includes the Lusatian culture in eastern Germany and Poland (1300 – 500 BC), which continues into the Iron Age. The archaeological site of Biskupin is another important place in north-central Poland, some ninety kilometers northeast of Poznan. The fortified community was originally located on an island of the Warta River. It is now part of a peninsula, which houses the reconstructed village and a historical museum. Radiocarbon dates from timber material ranged from 720 BC (first settlement) to 560 BC (later settlement). Biskupin belongs, in technical terms, to the Hallstatt C and D periods (early Iron Age). The rampart is made around 620 BC. The settlement was abandoned around 450 BC. The defense system might be created to counteract the aggressive German tribes pushing eastwards. The discovery of the settlement in 1933 by a local schoolmaster became, for that very reason, a symbol for Polish national consciousness. Researchers from the Poznan University started investigations in 1934. The site was nicknamed the ’Polish Pompeii’ as a reference to a glorious past. The Germans renamed the place ‘Urstädt’ after the occupation of Poland in the autumn of 1939. The excavations were resumed in 1940 under the patronage of Heinrich Himmler and continued until 1942. The place was then flooded, which contributed to a good preservation of the woodwork. Fig. 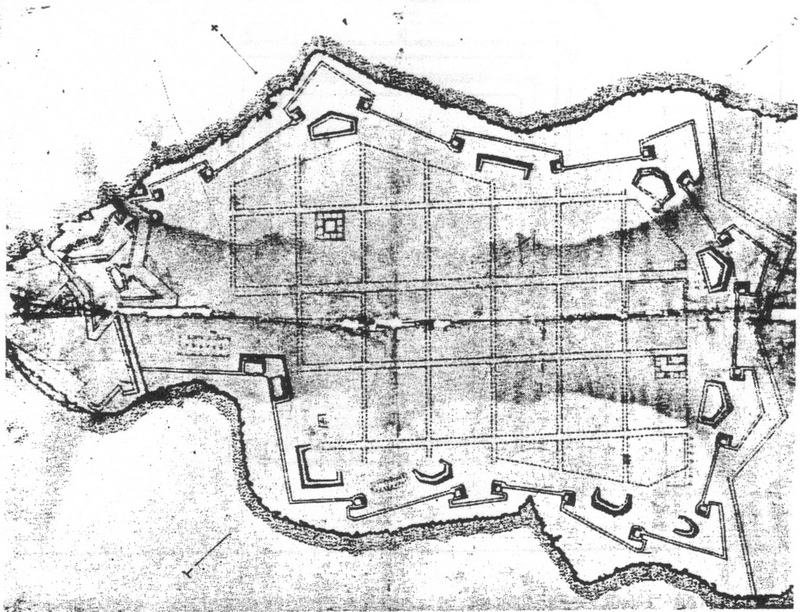 598 – A reconstructed plan of the fortified settlement of Biskupin, Poland. Thirteen rows of houses were protected by a wooden dyke. The embankments had a gate with a watchtower and a footbridge. A circuit street ran alongside the rampart. The works of Roman castrametation survived in the layout of monasteries (like S. Gallen, see fig. 335), and must have circulated in the collec-tive memory of the builders of the new towns in Europe in the twelfth and thirteenth century. The Anglo-French ‘bastides’ – with the square layout as their hallmark – have already been mentioned. The town of Aigues-Mortes in the Camargue (Southern France) can be seen as the crucial onset of royal interference with rectangular city building, which lasted some hundred years (1270 – 1373). King Louis IX (Saint Louis, 1214 – 1270) founded the town in 1246 as a square with a number of crossing streets. Defensive walls were added from 1272 onwards and ten city gates were placed at roads entering the town. The total length of the walls is now over one-and-a-half kilometers. A rough six by six grid of blocks was loosely administered, with subdivisions and amalgamations. Inspiration of the design might have come from the city of Damiette (in Egypt) or Acre (Saint Jean d’Acre) in Israel, both fortified cities at the sea, which played a role in the Crusades. The number of German towns grew tenfold during the thirteenth century – although Germany-as-a-country did not exist at the time. Cities with a central market square and a checkerboard layout in Germany and Poland included Neu-Brandenburg (1248), Retz (1275), Wohlau, Oschatz, Gleiwitz (Gliwice) in Upper Silesia – known as the site of the provocation that Hitler staged as a pretext to invade Poland – Hamm (Nordrhein-Westfalen, 1226), Leoben, Budweis, Wroclav and many more. Rectangular grids are known from Austria (Bruck-an-der-Mur, 1263) and from Italy, with places like Manfredonia (Province of Foggia, Apulia; founded by King Manfred in 1256) and Cittaducale (Province of Rieti, Lazio; 1309). Fig. 599 – The plan of Villarreal (Castellon, Spain) is a rectangular plan surrounded by walls with four towers in the four corners. Briviesca, near Burgos (Spain) is a typical regular Castilian town of the fourteenth century. Similar cities in the northern Basque area are Durango, Salvatierra, Bilbao and Guernica. GUTKIND (1967) mentioned in his book on the ‘Urban Development in Southern Europe: Spain and Portugal’ a number of systematically planned (grid) towns, like Puente la Reina (in Navarra, established in 1090) and Castellon de la Plana, Villarreal (fig. 599), Nules and Almenara in the Castellon region. Gutkind noted (p. 147) that the ‘Spaniards are always torn between two extremes’ and that the todo o nada attitude had dominated the Spanish political and social history. He pointed to an inflexible national character, which was prone to irrevocable and rigid alternatives and links this mental situation of no compromise with the Spanish landscape. However, this dualistic aspect ‘has created great architecture and great cities’. The enclosed town concept flourished in those maturing years of Europe as a cultural entity, but practical considerations came into conflict with the preconceived ideas. Extensions of the town were difficult, because the (square) markets were wedged into the houses. Furthermore, the reality of stagnation was a real threat. The Black Death of 1349, which wiped out a quarter of the population in some areas of Europe, contributed to the economic depression on the continent. The attention was focused inwards (miniatures) for some hundred years. It was the Renaissance in Italy and its renewed quest for identity – around the year 1450 – that set Europe in motion again. The city of Santa Fe, west of Granada (Andalusia), is still one of the finer examples of a grid town, founded in 1492 (the year Columbus discovered America). This agro-military town started as a military camp for the troops, which besieged the city of Granada. The first camp was destroyed by fire, but a new layout was built in the immediate neighborhood. 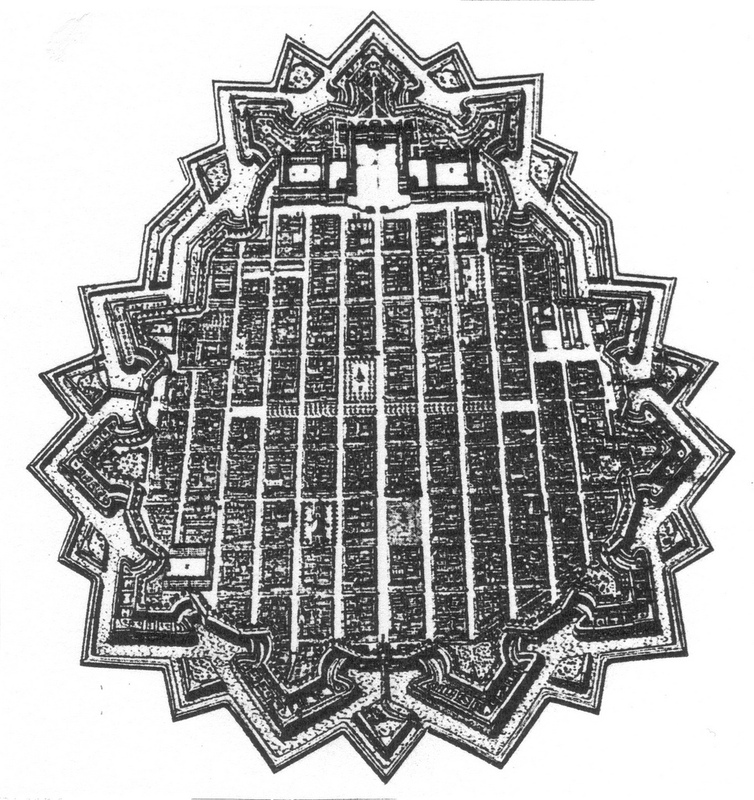 The Plaza de Armes was in the center and the walled city had two principal streets and four gates (fig. 600). An earthquake destroyed the town in 1809, but it was completely rebuilt. Fig. 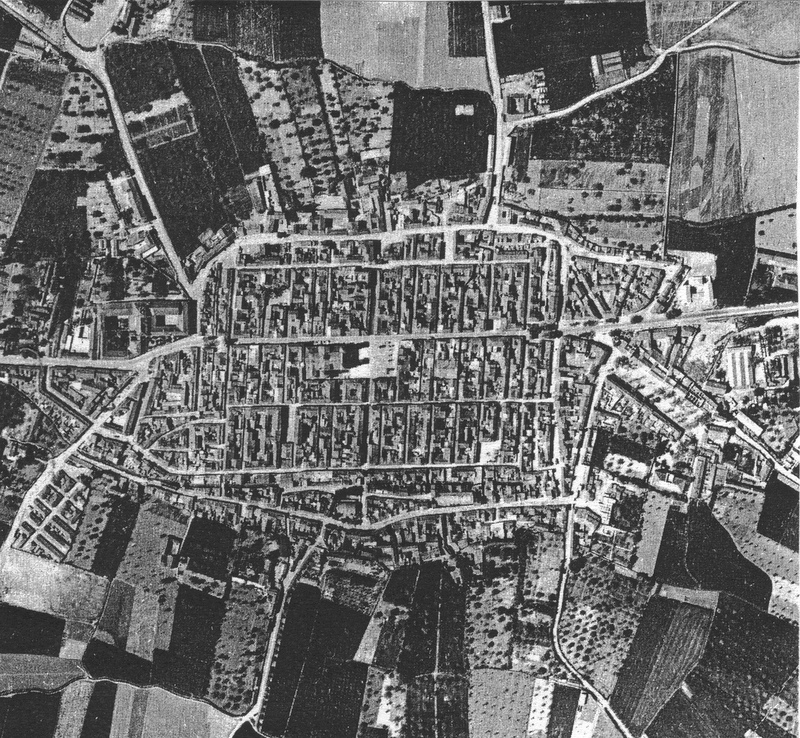 600 – An aerial photo (of 1958) of the city of Santa Fe de Granada (Spain) shows the regular pattern of its design. The city was founded in 1492 as a purpose-built garrison town, west of the city of Granada. The city of La Valletta on the isle of Malta was a ‘bastion of Christianity’ (KRUFT, 1989; p. 52) and became an example of a new type of city planning, which implied the growing importance of artillery. The Johanniter order (the Knights of St. John) had to leave the island of Rhodos in 1522, which had been their base since 1310. They were more or less forced – by the German Emperor Carl V – to go to Malta and to start again. Their dominant position on the island lasted from 1530 to 1798 and La Valetta became their stronghold. Fig. 601 – The second plan of La Valetta (Malta) by Francesco Laparelli (1566) indicated a grid-like layout within the confines of the city walls and a star-shaped bastion. KRUFT (1989) gave the illustration upside down. The north is here to the top. Military engineers arrived on Malta in 1532 and improved the weak existing forts. After some initial hesitation about a permanent stay, the insight grew, in 1557 that a new city was necessary and plans were drawn. Further improvement of defense buildings took place after Turkish beleaguering in 1565. The military engineer Francesco Laparelli (1521 – 1570) stated: ‘It is a great thing to lay the foundations of a new city, built her defenses and let the people live in it and admire: these things are the daughters of immortality.’ The decision to enlarge La Valetta was formally taken on the 14th of March 1566. 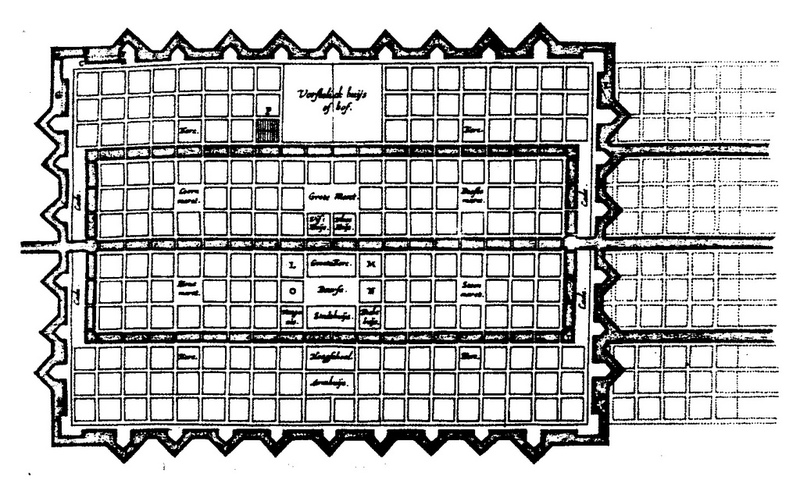 The city plan followed a chessboard pattern within irregular defensive walls (fig. 601). Laparelli and his supervisor Gabrio Serbelloni must have known Pietro Cataneo’s influential book ‘Quattro primi libri di architettura’ (1554). This set of four books on architectural theory was particularly concerned with the design of fortified cities, materials, ecclesiastical and domestic architecture. His plan for an ‘ideal city’ might have influenced Richard Newcourt’s proposal for the rebuilding of London after the Great Fire in 1666. The book inspired the orthogonal schemes of early American cities like Philadelphia and Savannah (see fig. 609 and fig. 611). The Flemish mathematician and engineer Simon Stevin (1548 – 1620) was born in Bruges and lived in Leiden from 1581 onwards. His first publication was on interest tables (‘Tafelen van interest’) in 1582. The manuscript had been circulating in the banking community throughout Europe and was considered as secret information. Another important work was ‘De Thiende’ (The tenth; 1586), a booklet introducing decimal fractions in Europe. 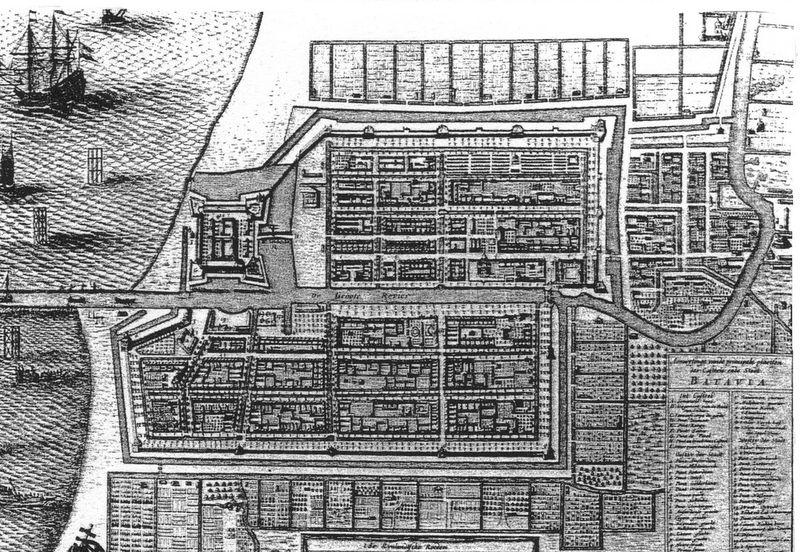 The Renaissance knowledge on defense cities was formalized in his book ‘De Stercktenbouwing’ (1594), using geometrical techniques to reach the best practical form (fig. 602). The book on ‘Castrametatio’ (1617) was an elaboration of the theme. Further interests were focused on mechanics (De Beghinselen der Weegconst, 1586), astronomy (De Hemelloop, 1608), civil life (Het Burgherlick leven, 1590) and music (The Spiegheling der Singconst, 1884). He published a total of eleven books covering diverse subjects like trigonometry, architecture, geography, fortification, navigation and musical theory. Fig. 602 – An ideal port plan by Simon Stevin (1590) was constructed along geometric lines with the gridiron as a leading principle. The grid-design found its followers in the Low Countries in the seventeenth and eighteenth century. 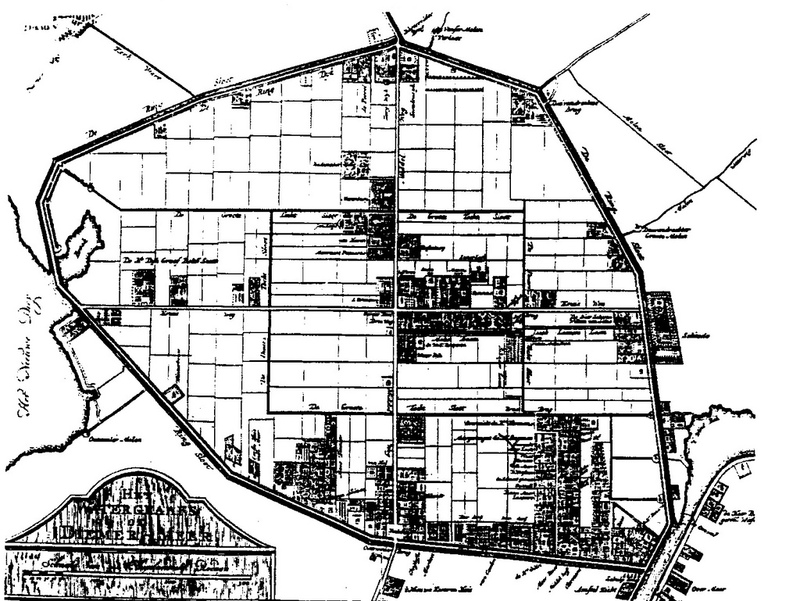 The newly developed polders (drained lakes in peat areas) were often divided in rectangular plots, like the Beemster (1612), Schermer (1635) and the Watergraafsmeer (1629). The map of the Watergraafsmeer (fig. 603) was drawn by Daniel Stopendael, with the northern direction to the bottom. The polder is divided in four nearly equal parts by two cross roads (the Kruislaan (Cross Lane) and the Middenweg (Middle Road). Fig. 603 – A plan of the Watergraafsmeer or Diemermeer as given by the polymath Mattheus Brouërius van Niedek in his book ‘Het Verheerlykt Watergraefs of Diemermeer’, Amsterdam (1721). The last of the great lakes to be drained and resulted in the Haarlemmermeerpolder, between Amsterdam and Leiden, in 1852. New projects of droogmakerijen (land reclamation) were initiated in the twentieth century in the former Zuiderzee (now IJsselmeer), resulting in the Wieringermeerpolder (1930), the Noordoostpolder (1942) and the Zuidoostpolder (Flevoland; 1957). The pattern of the roads, waterways and subdivisions was almost without exception of a rectangular nature. The Dutch also transposed the grid pattern to their colonies, notably to the port town of Batavia (Jakarta, Indonesia) (fig. 604). This colonial settlement developed along the contemporary notions of the ‘ideal’ city (NAS, 1997). Fig. 604 – The plan of Batavia (now Jakarta, Indonesia) is seen here on a seventeenth century map. 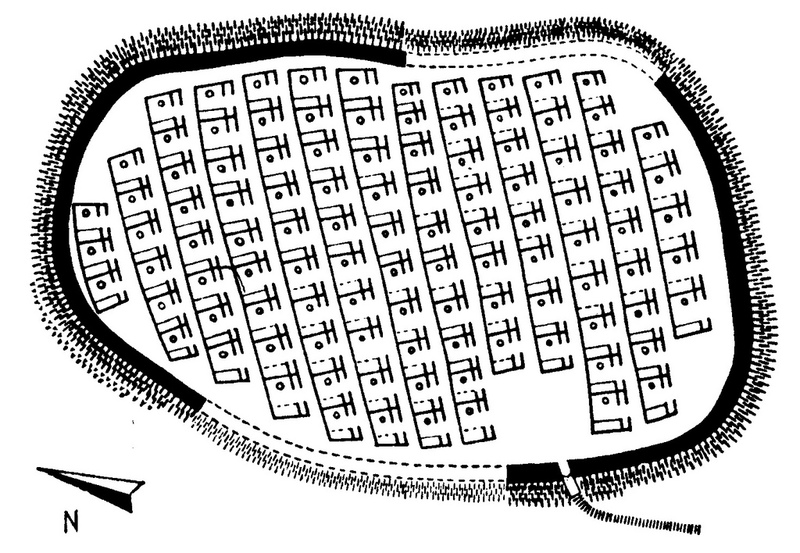 The layout consists of a four-starred fort and rectangular streets. More recent, but still in the aftermath of the Renaissance influences, was the redesigning of Baixa, the old city center of Lisbon (Portugal). An earthquake hit the capital of Portugal on November 1, 1755 with an estimated punt nine on the Richter scale and ninety thousand people were killed, due to the fires and a tsunami. About 85% of the city was destroyed. Marquis De Pombal (1699 – 1782) took control of the situation and initiated the rescue operations and a rebuilding of downtown Lisbon in a perfect rectilinear grid. Another Pombaline town is Vila Real de Santo Antonio in the southeast of the country at the Portugese-Spanish border (not to be confused with Vila Real, east of Porto, with its famous Mateus Palace). The fishing village of Vila Real de Santo Antonio was also damaged in the earthquake of 1755 and rebuilt in only five months in 1774 by Marquis De Pombal. 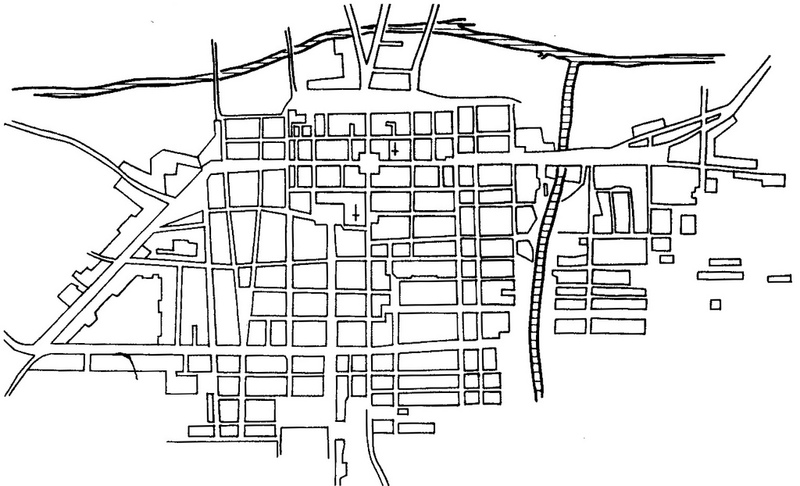 The town had a rigid grid, like Lisbon, but on a smaller scale. The grid was also ostentatious applied in the German city of Mannheim (Germany), on the confluence of the rivers Rhine and Neckar. Frederick IV (1574 –1610), Elector Palatine of the Rhine, initiated the building of the fortress Friedrichsburg and the grid-like city core in 1606 (fig. 605). Subsequently, history bestowed Mannheim with four destructions, but the original grid remained intact in the rebuilding efforts. Now the city bears its name as ‘Quadratstadt’ proudly, with a reference to the numbering of its housing blocks rather than given street names. Fig. 605 – A copper engraving of the city of Mannheim (Germany) as it looked in 1758. The fortified city and grid pattern was founded some hundred and fifty years earlier (1606) by the Elector Palatine of the Rhine Frederick IV and head of the Protestant military alliance known as the Protestant Union. 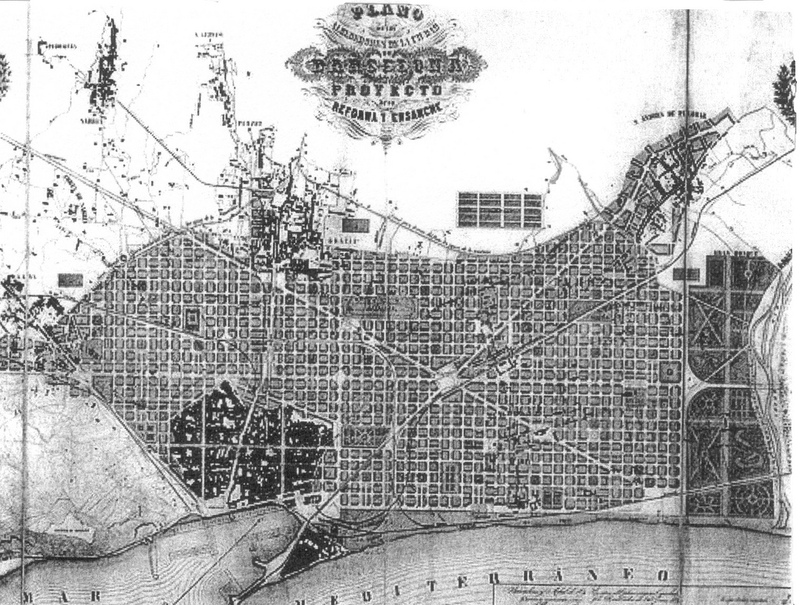 The nineteenth century saw a monumental rebirth of the grid as initiated by the Spanish architect Ildefons Cerdà (1815 – 1876) in the city extension, or Eixample, of Barcelona (Spain) (fig. 606). The population pressure of the city had reached a boiling point in the mid-nineteenth century. Some seven hundred residents lived on a hectare, in comparison to London (128 inhabitants/hect), Berlin (189 inhabitants/hect) and Paris (291 inhabitants/ hect) at that same period. The rule to leave an unbuilt area outside the city boundary to provide a field of fire could no longer be maintained. Cerdà’s new outlay was eight times larger than the existing city of three hundred thousand inhabitants. Fig. 606 – The Eixample of Barcelona as designed by Ildefonso Cerdà in 1858 was a bold design to release the pressure of the inner harbor city. It will come to no surprise that Spain took a leading role in Europe, since its rich tradition of colonial grid cities in Middle and Southern America provided a storehouse of experience. The concept was earlier tried on the barren plains of Spain itself in places such as Briviesca, Villarreal and Sante Fe de Granada. However, it seems that the widening of thinking in the Fourth Quadrant of the European cultural history (from the year 1800 onwards) was sympathetic to the orderly outlay. It could counteract the first signs of chaos when people drifted from the countryside into the city in order to enjoy the advantages of ‘urbanization’. Many other cities in Europe with similar population problems followed suit with rectangular layouts during their major developments in the (early) twentieth century, although the theme was wide and varied. It would lead too far to give even a concise overview of all these cities and their planned suburbia. 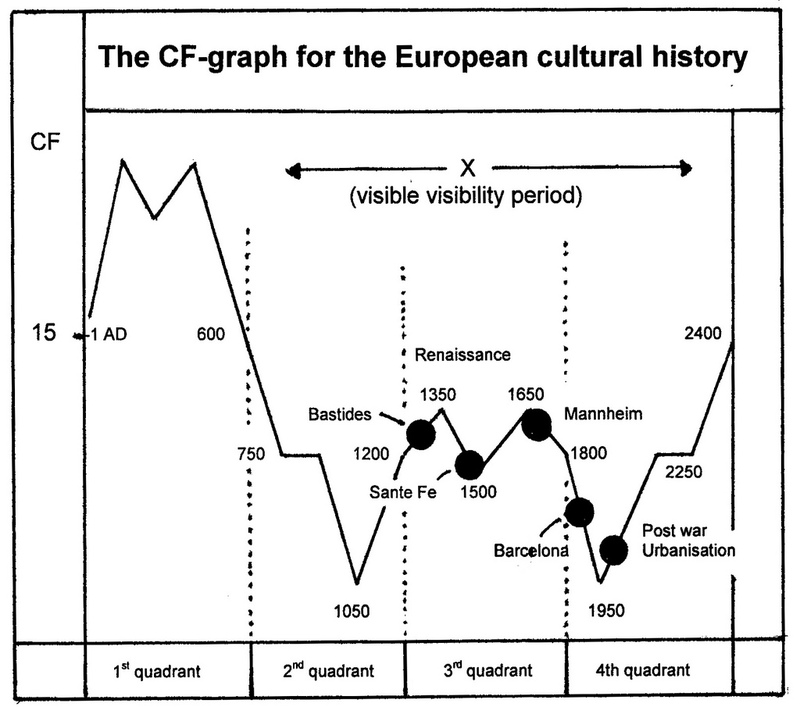 Instead, the main concentrations of grid towns in the visibility period (X) of the CF-graph of the European cultural history are plotted in fig. 607 (see also fig. 267). Fig. 607 – The European cultural history with the position of some of the grid towns mentioned in the text. The history of grid towns in Europe started with the legacy of the Roman Empire. The first visibility of Europe-as-cultural entity under the leadership of Charlemagne was positioned in the middle of the eight century (750 AD) and coincided with a consciousness of the division (John Scotus Eriugena’s The Division of Nature; SHELDON-WILLIAMS, 1987). The first European large-scale city development took shape in the thirteenth century, marking the emerging visible visibility of the Third Quadrant (III) of Europe. The Renaissance put a renewed emphasis on geometry and the esthetic-visual possibilities of division. However, despite the richness of concepts, the grid town never became the dominant type of city plan in Europe during this period. Most urban developments in the European realm took place under ‘natural’ conditions, with an emphasis on defense structures, because it was a time of (regional) power struggle. Occasionally, some fancy ideas about city planning could develop in the wake of the Renaissance. The grid concept gained new impulses in the Fourth Quadrant (1800 – 2400) of Europe’s cultural history. Cerdà’s Barcelona (1859) marked the beginning and many European cities followed suit. The Machine Age, with an accent on new technology and mass production left its marks in architecture. The ‘mass approach’ was practiced under the guidance of architects like Le Corbusier and set the scene for the massive post-war city development in Europe, with the ‘American’ way of urbanization and its grid design as a leading principle. The planned city of Milton Keynes (England) might be the zenith of this trend. The grid is since the 1960’s more and more replaced by a ‘street hierarchy’ with separation as a leading principle. Do you have a source/citation for figure 604?